Struck in solid 9-carat Gold and strictly limited to just 1,914 worldwide. This unique commemoration features the design of St George and the Dragon, The reverse design also bears a partial portrait of King George V.
Within days of the outbreak of World War I the British government asked members of the public not to withdraw gold from banks. Within a few weeks the gold sovereign - a symbol of the Empire and a gold coin in daily use in Britain - had been withdrawn. This commemorative coin minted in solid 9 carat gold marks the centenary of World War I. 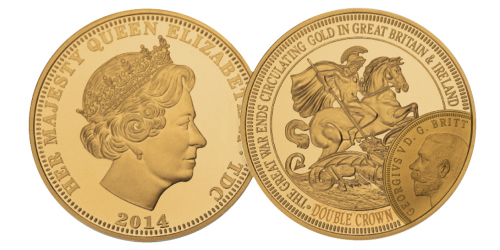 It features the design of St George and the Dragon, the very design that featured on the gold sovereigns that were withdrawn from circulation. The obverse bears a partial portrait of King George V.
Struck to the very highest quality Proof standard - the minting of the World War I Centenary Gold Double Crown Coin is limited to just 1,914 issues worldwide.